Li-Hua Weng is an experienced intellectual property attorney, specializing in patent prosecution, patent clearance searches and opinions. 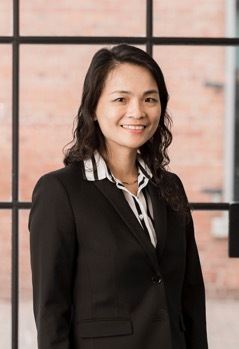 Prior to joining Burris Law, Li-Hua worked for 12 years as an intellectual property attorney at two top 10 IP firms in the U.S., and for 4 years as a patent engineer in a law firm in Taiwan. With an educational background in mechanical engineering and self-studying electrical engineering, Li-Hua has prepared and prosecuted patent applications in the fields of electrical heaters, plasma arc torches, liquid crystal displays and control, automobile powertrains and control, household appliances, business methods, software, and medical devices. Born and growing up in Taiwan, Li-Hua came to the U.S. in 2001 to study law, with a focus on intellectual property law, aspiring to become an intellectual property attorney. Li-Hua has published a law article, “Preamble Interpretation: Clarifying the ‘Giving Life, Meaning and Vitality’ Language,” on Boston University Journal of Science and Technology Law (2005), and contributed a chapter to a book, “Software Patents Worldwide” (2010), published by Kluwer Law International. Li-Hua is licensed to practice in Michigan and Illinois and before the U.S Patent and Trademark Office.